As the episode starts, we learn that JT is doomed to a safehouse-hopping existence until Vincent and Catherine deal with Liam, which brings us to the next main concern: Can Vincent face Liam without crossing to the dark side? or… as they would annoyingly say on TVD “without losing his humanity”? Vincent seems convinced that he can, JT sort of believes him, Cat… let’s just say she has her doubts. In any case, they don’t have to worry about finding Liam, because Liam finds them. He just shows up at Il Cantuccio, interrupts a Chandler sisterly reunion and demands a private audience with Cat. He suggests getting arrested and/or killing everyone in order to get some privacy. Well… he was accommodating, at least. Cat chooses “Option A” and takes Liam to the precinct. 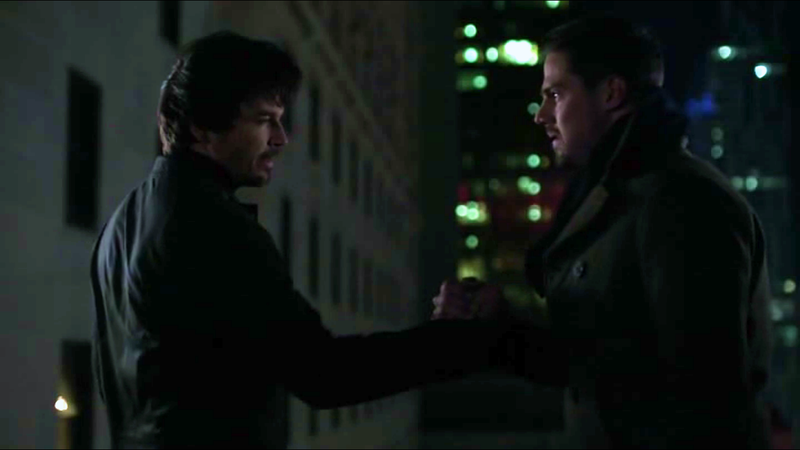 Vincent also shows up at the precinct because Liam summoned him “beast to beast”. He claims they have dog hearing or bat echolocation or something [1) I am sure this was an episode of Dark Angel 2) Didn’t V have feline DNA? Did they seriously mix cat and dog in that cocktail? Seems like a bad plan]. Liam doesn’t do much at the precinct other than mock Vincat’s epic yet-doomed [according to him] relationship and rant about the fact that beasts will be beasts and V should embrace that. It’s like Tori all over again, except Liam is not annoying AND he may actually be an authority on beasthood… but more on that later. Liam has to say goodbye because his lawyer shows up [yes beasts have lawyers too… not that shocking]. Not just that… turns out that Liam has the protection of a renowned philanthropist family: The Ellingsworths [now that was a bit shocking]. So the gang is left there to speculate about Liam’s true intentions. And what Liam really wants is what we all want: Vincent… but you know, not in the same way. Liam wants to be “beast buddies” with Vincent. Vincent is not instantly receptive to the idea, of course; but after Liam literally hangs JT and threatens Catherine [and a bunch of random innocent people], he accepts. Liam’s indecent Beast proposal consists of breaking into the DHS to destroy Alton’s blood which may lead to his blood, but also maybe Vincent’s blood and… there was a whole mumbo jumbo about DHS and blood which turned out to be a lie anyway so… for the sake of simplicity, let’s just say they are breaking in to destroy blood samples. Another nugget of doom we get from Liam is that JT is dying from serum poisoning. Beasts can smell death now… in case you were wondering. This might be news for Vincent, but JT is aware of his condition and he has been keeping it from everyone. Another thing JT has been keeping is the beaStone… but he can’t remember where he put it… seriously? How can you misplace a gigantic magical gem? Liam takes Vincent to a pre-break-in game of pool. As they play, Liam engages in some beast peer pressure. He wants Vincent to embrace his nature and let go of Catherine who has him on a leash. It’s the beast version of telling a guy he is “whipped”. In the meantime, Cat has come up with a [very convoluted] plan. She wants to get to Helen Ellingsworth, convince her that Liam is evil so she withdraws her protection, let Liam break into DHS, catch him in the act and arrest him. To make the already complicated plan more complicated, Helen is at a private party. So before the beasts go DHS crashing, Cat needs to crash a party. Cat manages to infiltrate the party and find Helen Ellingsworth. She tries to give Helen a flashdrive containing Liam’s greatest [literal] hits, but she doesn’t want to hear about it. In the end, the joke is on Cat when Helen confesses that she won’t turn on Liam because he is her brother. Cat asks JT to debunk the DNA test and prove that Liam is not Helen’s brother… and he is NOT. He is her great great great… many greats grandfather! Dun dun dun. Not only that, Heather realises that Liam looks familiar because she saw his picture when she was investigating the Reynolds’ family tree. He was the other beast hunting Alistair and Rebecca! AND he was engaged to Rebecca before she left him for Alistair. Gotta say… I am all for this crazy sci-fi development! Now… this is actually making the whole “destiny” thing click. I hope we get another flashback episode! While we find out that Beasts can live as long as whales [they sure put a LOT of animals in that cocktail], Vincent and Liam arrive at DHS. Liam keeps tempting Vincent with all sorts of fun beast activities like making impossible rooftop jumps and breaking unbreakable doors. Vincent enjoys some of it, even if he doesn’t want to admit it. However he gets very upset – code yellow upset - when he realises Liam lured him into the DHS under false pretences [shocker]. The DHS never had V’s blood. Liam just wanted an excuse to awaken his beast side. But they don’t have time to argue because SWAT is on site. Liam escapes through the window, but not before giving V an ultimatum “you are either with me or against me”. Vincent follows Liam… because… come on, he was beasted out in the middle of a government facility. I don’t think he had a choice. However, Liam gets all excited and takes it as a sign that Vincent is “with him”. But Liam’s beast bromance dreams are crushed when Vincent throws him out of the roof without a warning. Unfortunately, Liam survives the fall. But Vincent’s humanity doesn’t “break” [you could say he is “unbreakable” because of Cat]. Cat gets out of the building just in time to see Vincent NOT cross over to the beast side. Cat smiles up at Vincent relieved. Who knew watching your boyfriend throw someone from a tall building could be so touching? And can we celebrate the fact that V did not require a sanctimonious speech this week? As the episode ends, JT and Tess have an emotional conversation. In the middle of the commotion Tess found out that JT might be dying. JT didn’t want her to see him as vulnerable, but Tess assures him that she loves him no matter what and she wants him to let her in. JT still has faith that he will find a way to beat the serum… He better! Back at Casa Chandler, Heather – who is now the resident researcher – shares more information about Liam. Apparently he was abandoned when he was a kid and put into an orphanage, which is always the perfect backstory for misunderstood baddies. Vincent asks Cat to go for a walk and that’s when I thought: Something significant is about to happen! Cat and Vincent are going to a very relevant place or Heather is going to be left alone and kidnapped AGAIN. But, no… Cat and Vincent were actually just going out for a walk. An exposition walk where they recapped all the episode and all the things that need to happen before the finale. Well… at least they were walking… but seriously, if you want to pull-off a good “walk and talk” you need Sorkin-level dialogue! But OK… I’ll let this one go just because I liked the episode. I was once again pleased with this episode. I found myself intrigued and surprised [which hasn’t been happening much lately]. I can get behind some sci-fi plots but a little skeptical about others. This Highlander/Forever type plot development is the kind I like. So I am excited about where it goes. And did I mention how much I love Liam? I loved the idea of the character (and Jason) since it was announced. But seriously, everything is working for this character. The casting, the writing, the delivery of the lines and even the connection with the mythology. I am so afraid that they are going to kill him! I really hope they don’t! When they went for a walk I was waiting for something to happen ... I mean ... it was a bit weak end, but overall, was a good episode. I'd also really like Liam, and his interactions with everyone else. Since Liam couldn't break down the HS lab door without help, what a good place to imprison him. But of course they would have to add an alarm of some sort. You would think HS had alarms that go off if someone breaks in. What happened to Vincent's ability to know when someone is telling a lie? Apparently beasts can lie to one another and without being caught. all in all it was a fun and exciting episode. Love Liam's sarcasm about "innocent lives" it is about time someone offered some irony about this. Not sure what was Liam's purpose to get himself arrested other than the writer needed a simple way to introduce the Ellingsworth connection. Too bad the production values were non existent. Where was the editor this week? Snow on Vincent's collar until they turned the corner. The necklace inside or outside of Heather's coat. Or the ripped shoulder on her jacket when they got to the precinct. It was either the director or the editor at fault here. I suppose we shouldn't notice the bad editing. More likely we should wonder why suddenly after all this time, if Vincent jumps over a rooftop, he will become primal. Didn't he jump over rooftops in 3.01 to be on time for his date with Catherine? The last half of season 2 while he was a fugitive, he met her and jumped off the roof all the time but it didn't make him go primal. I wish the writer would be required to do some homework about the character instead of just making it up as they go along. Why couldn't Liam have been casted in S2? He's believable as a big bad and would have been perfect as someone who was tempting Vincent to his beast side. Would have avoided the catastrophic and horribly written Tori and Gabe arcs. Vincent and Liam worked well off each other in this episode. I loved Liam's "a kill is a kill, a beast is a beast" response to Cat and Vincent. Also liked the scene where Vincent and Liam were squaring off at pool and Liam accuses Vincent of using his beast vision to win (and props to the show for using "When You Coming To See Me" by MAWR druing this scene, too).